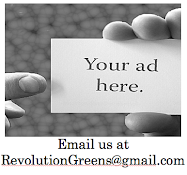 Its another Beautiful day at the Revolution Greens Headquarters here in Miami, FL. We are getting ourselves ready for one of our favorite holidays, Thanksgiving. In the USA we love our food. So much so that when we had the chance to establish our first national holiday, it was Thanksgiving, a feast that doesn't merely accompany a celebration but in effect is the celebration! That is why we want to share with you how you can make your Thanksgiving more like the first one celebrated. This year the goal is to use real foods that have not been chemically engineered or grown in a factory. Two of our Revolution Greens Army, David Turk and Nick Leone, took to the streets of New York City and filmed some impromptu interviews with local farmers at the Stuyvesant Farmers Market. What they found-- Farmers using their market stands to take a stand against the big corporate farms. Lets show our local farmers our support this year. Buy at least one item from your local farmers to serve at your thanksgiving dinner. Use www.localharvest.org to find where you can buy some great items. Thanks for the great video. Keep it Up!